We all know how important cardiovascular exercise is for weight loss, but sometimes, we just don’t have the time for a full hour-long run or fitness class. These seven ways to burn maximum calories in the minimum amount of time are a great way to get a full workout in less than 30 minutes. There’s a reason HIIT is so popular: It allows you to complete a challenging workout that works your whole body in a short amount of time. HIIT also helps you burn calories even after your workout is over by creating an oxygen debt that your body has to work to repay post-workout, revving your metabolism. Try incorporating Jess Doss’ Orangetheory 20-minute HIIT routine into your fitness schedule and watch your body transform. While we’ve all enjoyed the occasional stationary bike ride with a magazine in our hands, for maximum impact, do short sprint intervals on the stationary bike followed by periods of slower cycling. You can do this on your own, or sign up for an express cycling class at your local gym. If you’re tired of using the same old cardio machines, grab your swimsuit for a calorie-torching workout in the pool. Vary your strokes from freestyle to breast stroke to butterfly for a powerful, calorie-torching workout. You can even incorporate some underwater strength moves to work your muscles even more. 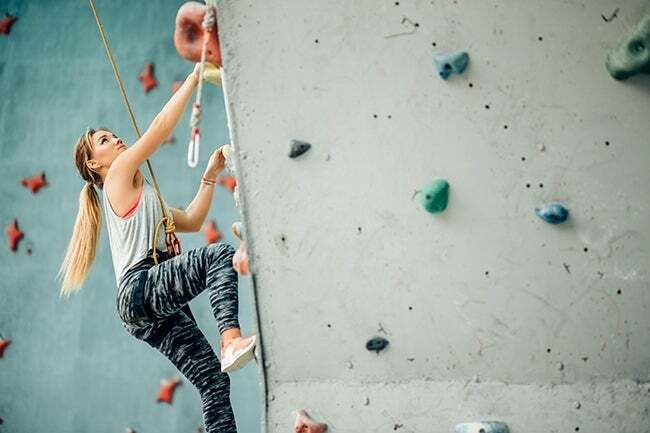 A common misconception is that rock climbing only works out your arms, but in fact, it takes a full-body workout to get yourself up that wall. Climbing also combines short bursts of intense exercise with periods of lower intensity, making it similar to HIIT in its calorie-torching abilities. Check out your local climbing wall for beginner membership deals. The rowing machine is often the most neglected piece of cardio equipment in the gym, but in fact, rowing is a great, whole-body workout. Rowing uses large muscle groups, which requires the body to use more energy, and thus burn more calories, in order to engage those muscles. Build short bursts of speed into your rowing session to ensure you hit the 300-calorie mark. Kettlebells are a great way to build strength, cardiovascular endurance and flexibility. Using them for just 20 minutes can burn 400 calories! Check out our 20-minute kettlebell workout for inspiration, and get lifting! Remember, exercise is all about quality over quantity. All of these activities give you a fast, effective workout that helps you build strength and burn calories.